The Yukon, the biggest river on the North American continent, became famous in the period from 1896 to 1903, when in hope of making a quick fortune prospectors stampeded it. This period is known as the Klondike gold rush, and an estimated 100,000 people were prospecting gold during that time. The gold rush was over almost as quickly as it came, but the people that live there believe that the river still contains plenty of the shiny ore. The playing area consists of a 7x7 card grid. The starting player may decide to take a card from the row or the column that the gold digger is standing in. This card is placed in front of the player, and the gold digger is moved to the spot the card occupied previously. This ends the player's turn. The next players may always take a card moving in a perpendicular direction from the previous movement. The gold digger always moves to the newly freed spot. 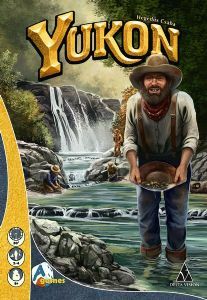 The game contains the townsfolk expansion that includes 30 extra cards (10 characters, 3 of each) and 9 gold nugget tokens.